I never liked Eggplant Parmesan much as a kid. I just didn’t really like eggplant, with its black skin and mushy insides. But things have changed a lot since then. 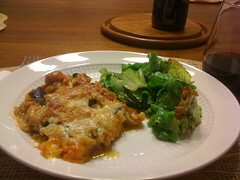 I eat eggplant regularly and have had many a delicious eggplant parmesan in many different styles. And though I’d looked up recipes for eggplant parmesan before, I’d never attempted it since it seemed like a time-consuming dish to make. 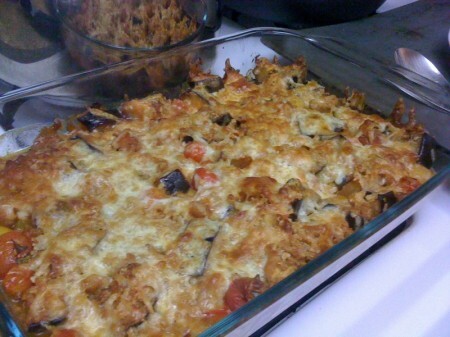 But last week a new recipe popped into my Google Reader for “Healthy Eggplant Parmigiana” and I just had to take a look. I suppose it’s healthier than the traditional breading and frying the eggplant versions, but it’s still not exactly healthy, with a good amount of cheese and olive oil. But, of course that’s what makes this dish delicious. Essentially, it’s just chopped up eggplant and tomatoes mixed in with some parmesan cheese and breadcrumbs and topped off with mozzarella cheese. And after it’s been in the oven about 40 minutes, all the flavors just come together beautifully underneath and crispy, browned crust. I had to make a few modifications to the recipe — I didn’t have enough tomatoes to puree or any canned tomatoes, so I just mixed some tomato paste with water until the flavor seemed right. I also didn’t use panko breadcrumbs — I just used some toasted breadcrumbs I’d made recently with some leftover Irish soda bread. Anyway, this recipe is definitely worth a try — it’s hearty, easy to prepare and has lots of vegetables. I served it with a very simple green salad with a dijon balsamic vinaigrette. Check out the recipe at the Diner’s Journal blog.